Which Colocation and Wholesale Data Center Operators in Greater New York City Are the Most Digitally-Savvy? The data center industry is changing fast, and the Greater New York City regional market is no exception. AT&T still wants to sell off its data center business including facilities in Manhattan (NYC2 / 811 10th Avenue) and Piscataway, New Jersey (PNJ1 / 3 Corporate Drive North). Cyxtera Technologies has closed on the purchase of six data center facilities in the region formerly owned by CenturyLink. Its locations in the Garden State now include Jersey City, Newark, Piscataway, and Weehawken. Digital Realty has closed on the purchase of DuPont Fabros Technology. This brings its footprint in the Greater New York City area to 11 facilities in Manhattan, Trumbull, Connecticut and throughout Northern and Central New Jersey including Clifton, Piscataway, Totowa, and Weehawken. Equinix has closed on the purchase of Verizon’s data center portfolio. Its 11 facilities in the region now span from Elmsford, New York to Manhattan to an extensive footprint in Secaucus, New Jersey as well as North Bergen, Newark, Carteret, and Piscataway. Iron Mountain has closed on the purchase of IO Data Centers. This gives Iron Mountain presence in Edison, New Jersey. But it’s not just the data center industry going through dramatic changes and challenges. The broader IT and business marketplace in the Greater New York City region -- including Long Island and much of New Jersey and Connecticut -- is seeing tremendous transformation, growth, and disruption. United States Census Bureau estimates still see the region as the most populous in the nation with the biggest population growth in recent years (from 2010 Census to 2016 estimates) in Hudson County, New Jersey (6.89%), Bronx County, New York (5.10%), Kings County, New York (4.84%), Queens County, New York (4.59%), Bergen County, New Jersey (3.76%), New York County, New York (3.65%), Union County, New Jersey (3.57%), Middlesex County, New Jersey (3.36%), and Somerset County, New Jersey (3.19%). Especially notable, colocation and wholesale data center providers have facilities in half of these counties. Even before considering how this population growth impacts digital transformation and requires more data center capacity across a handful of especially data-centric industries, we’re already seeing drastic changes in buyer preferences -- regardless of whether we’re talking about influencers or decision makers. Starting with the release of the original iPhone in 2007, the way people research and make purchase decisions changed. Word of mouth. Cold calls. Cold emails. Interrupting people with obnoxious, self-serving advertising. Direct mail. Print advertising. All of these marketing channels that were mainstays of business development playbooks, literally for decades (1980s, 1990s, and early 2000s), have been called onto the mat. In nearly all cases, these channels have become far less effective and have gotten far more expensive. Why? People grew tired of interruptions and proved they were willing to pay to get what they wanted (no more, no less), exactly when they wanted it, 100% on their own terms. The empowerment rooted in search engines, social media, mobile devices, and cloud computing has fueled entirely new business models based on selective consumption of information. People subscribe to streaming video services like Netflix and Hulu -- and use DVRs -- to avoid watching commercials. People subscribe to satellite radio providers like SiriusXM to avoid annoying radio advertising. What many miss: all of these personal preferences that may start at home don’t stay at home. These same influencers and decision makers, and all the other stakeholders that purchase data center-related products and services bring these preferences into the workplace. Ironically, the data center, mission critical, cloud services, and telecommunications industries have benefited greatly from all of this growth in demand. Yet many of those in leadership roles at outsourced data center providers have failed to appreciate how these changes impact demand generation, desired customer experience, differentiation, competitive positioning, and their ability to stave off market disruption. Technologies like Gmail’s Priority Inbox make it tougher for any commercial email to make it to the Inbox. And do people answer their phones anymore without checking caller ID? The rules have changed for businesses of all sizes and shapes -- including colocation and wholesale data center providers in the Greater New York City region. Their clients and potential clients have become accustomed to -- in many cases, addicted would be the more accurate term -- using search engines, social media, and mobile devices to find answers to questions and seek out solutions to problems. 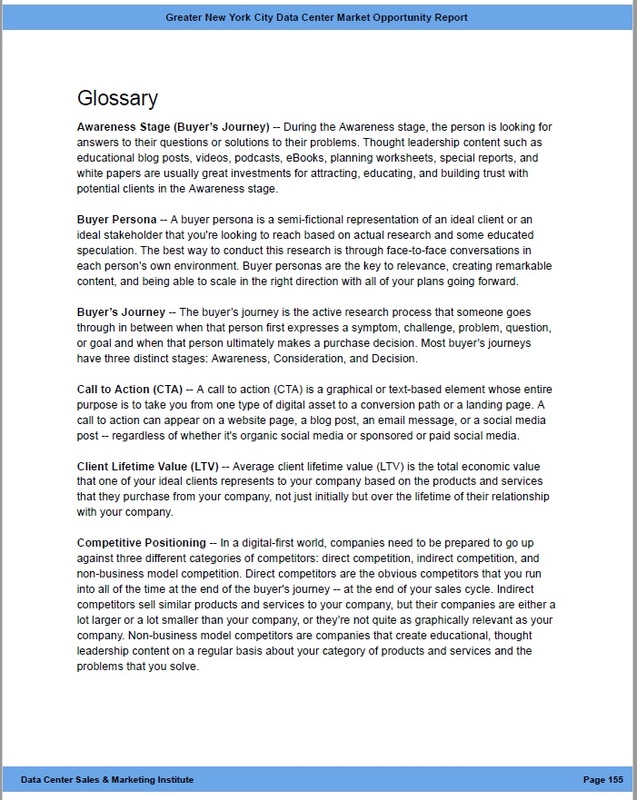 Regardless of required power, bandwidth, space, or industry-specific needs, this behavior change has completely upended the buyer’s journey -- the active research process someone goes through in between when that person begins searching for answers and when that person becomes a paying client. In the pre-iPhone era, potential clients reached out to IT companies like colocation and wholesale data center operators for information when they were 10% to 20% of the way through their decision-making process. Those days are long, long gone. Today, as much as 70% (or more) of their decision may be over before a potential client even reaches out to a colocation or wholesale data center provider. This change in the decision-making process presents enormous challenges to most data center operators in the Greater New York City area that are stuck in the past, using the same business development, marketing, and sales playbook that they’ve used since the 1980s and 1990s. But digital transformation also presents enormous market opportunities for digitally-savvy data center providers that can get found by the right influencers and decision makers, in the right places, at the right time, and most of all: in the right context -- to be seen as trusted advisors and educators, rather than just IT vendors. In the Greater New York City Data Center Market Opportunity Report, we’ll explore which colocation and wholesale data center operators in the Greater New York City area are the most digitally-savvy -- and doing the best job keeping up. Have at least one multi-tenant data center location in the Greater New York City Metro area. This includes the Long Island and Hudson Valley regions of New York, Northern New Jersey, much of Central Jersey, and Lower Fairfield County, Connecticut (within a one hour’s drive of Manhattan, to directly compete with colocation and wholesale data center operators in the Greater New York City metro area). Be principally in the business of selling colocation and wholesale data center services (leasing space), as opposed to primarily selling website hosting, cloud services, or managed services. Use the words "data center" and/or "colocation" in their website Title Tag or above the fold on their website home page. Have a functional website that displays their physical data center address(es) in the Greater New York City metro area. Have a separate website page for each data center facility location in the Greater New York City metro area. Have a LinkedIn company page that employees are attached to. We ended up with 36 data center operators that have 89 physical data centers located anywhere from Trumbull, Connecticut down to Wall Township, New Jersey -- which we believe will further contract as more mergers are announced and completed in the coming months and years. 23.6% (21) of the facilities are located in New York, New York (Borough of Manhattan). 12.4% (11) of the facilities are located in Piscataway, New Jersey (Middlesex County). 9.0% (8) of the facilities are located in Secaucus, New Jersey (Hudson County). While we don’t believe that these 36 companies represent all of the outsourced data center operators in the Greater New York City region that meet the criteria, we do believe that the companies included are representative of how digitally-savvy data center providers in the Greater New York City area are. On some metrics, we offer a median or average for that metric immediately before the table that presents how each company fares relative to its competitors. In many cases, the median number is presented to avoid skewing data due to very large company size differences between some of the smallest and largest data center providers in the region. In other cases, where a massive company size disparity shouldn’t impact more accurate comparisons, a simple average is used. And in a few cases, the data is normalized relative to the number of employees and presented in both absolute form and on a percentage basis. Just as a balance sheet is a snapshot in time, the data in this report was gathered during a one week period in March 2018. It’s fully expected that the outsourced data center operators within this report, and others that read this report, will make changes to their websites and broader digital presence. 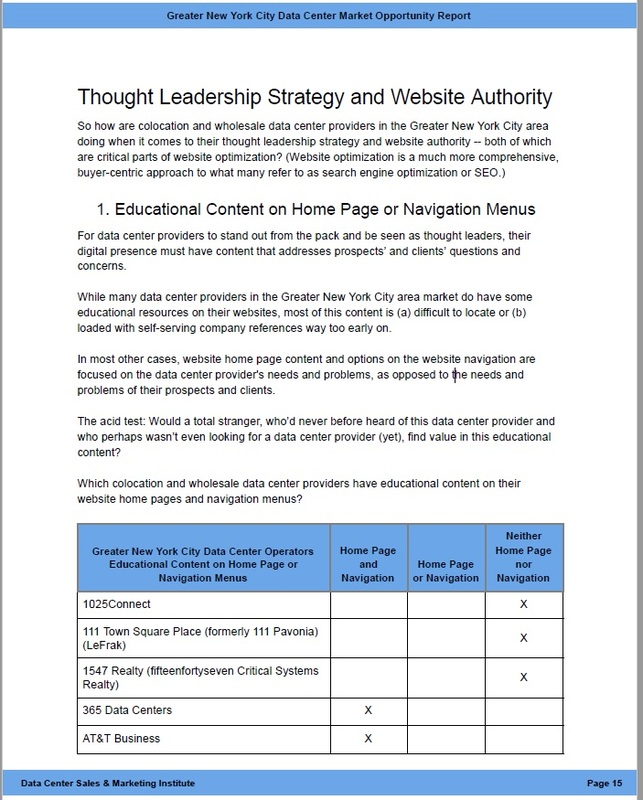 However given that a few of the companies in this report had let their websites sit stagnant for literally years, there will be some resistors who believe that their clients are different -- and don’t use search engines, social media, or smartphones. And just to be clear: While we do know stakeholders in various roles at 15 of the 36 data center operators included in this report, none of the data center operators in this report paid for inclusion/sponsorship.